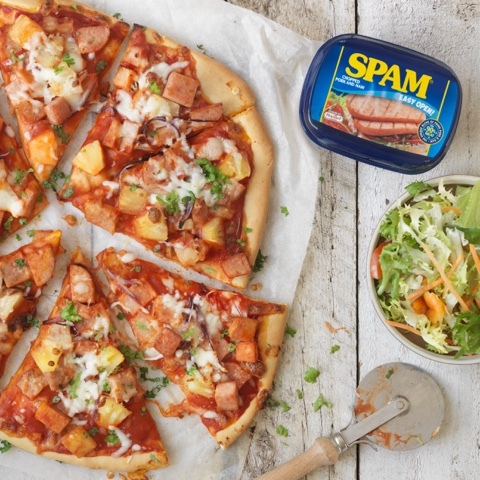 Hawaii has the highest rate of SPAM® consumption in America so it seems only fitting to create a SPAM® Hawaiian Style Pizza! 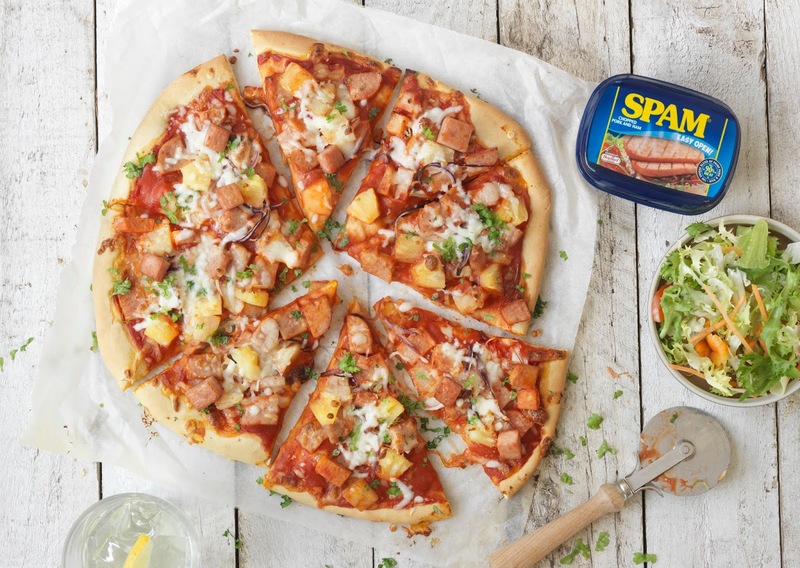 Pineapple splits the crowd when it comes to pizza toppings but combined with SPAM® Chopped Pork and Ham they are a match made in a tin can - if not in heaven! SPAM. SPAM. SPAM. No, not the annoying stuff clogging up your inbox but the iconic meat in a tin. SPAM® Chopped Pork and Ham. What does it mean to you? Monty Python? School Dinners? Guilty Pleasure?! Over the years it has been maligned, celebrated and musicalised. SPAM Fritters were one of my absolute favourite school dinners back in the day accompanied by the obligatory ice cream scoops of mash and spaghetti in tomato sauce. Nostalgia ain't what it used to be. Would you believe that the world’s most iconic meat is celebrating 80 years as a global brand this year? 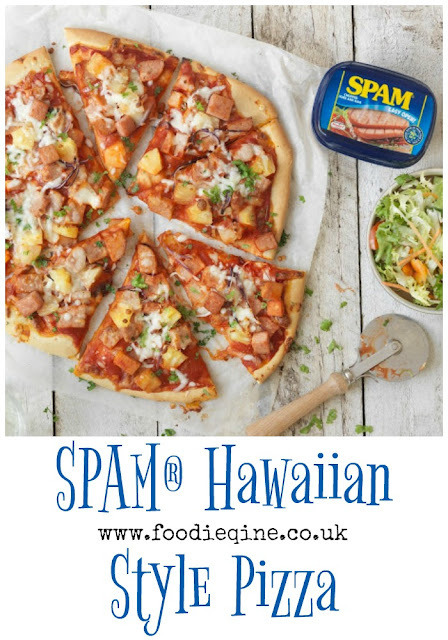 What better time to celebrate in the UK than the official SPAM® Appreciation Week which kicks off today and runs from 6-12 March 2017. The popular SPAM Can Tour will also return for second year, launching in Liverpool on 6th May and touring the country until end of August. The specially designed, eye-catching airstream will be serving up free SPAM samples, giving away recipe ideas, plus exciting opportunities to obtain limited edition merchandise. To celebrate SPAM Appreciation Week, there’s also a chance for fans to win a VIP trip to the Liverpool event and be special guests on the first tour stop. 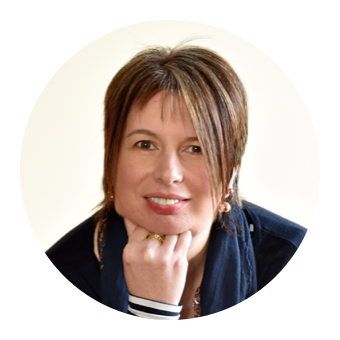 Once out of the can SPAM® Chopped Pork and Ham is certainly more than just a square meal! SPAM can… be sliced, diced, chopped, grilled and fried to make delicious quick and easy meals and snacks. Why not try SPAM as a pizza topping as per the recipe below? Disclosure: This is a sponsored post for SPAM Chopped Pork and Ham. As always, all views expressed are my own. Image, recipe and prizes courtesy of SPAM. Spam is one of those foods that is just perfect for camping. It's full of energy and is great chopped up into a pasta sauce or simply sliced between bread with some Branston pickle. Love it! I don't think I have ever eaten Spam, other than just as it is. Spam fritters! Great memories of childhood! My son loves them! I like it fried on the beach in the hot sun on a burger bun with lots of tomato ketchup, but this pizza sounds awesome! I've always had it with chips and beans! Looking on the website, I really want to try it in the breakfast burrito! Deep fried, in a lovely crispy batter :-) I also love it in a sandwich, like a BLT, only substituting the bacon for the Spam. Has to be classic SPAM sandwiches for me - with pickle! I like it fried (instead of bacon)with egg sausage and mushrooms. Not had it for years, always remember it just being pan fried and having it with chips. I haven't had spam in so long! I loved it in a grilled cheese sandwich. This looks super yummy! Spam with fried eggs and chips. I like Spam in a sandwich with a bit of salad, real meaty mouthful. Love it in a sandwich with spicy hot sauce. I like SPAM grilled in a sandwich for breakfast. Nothing fancy...a plain sarnie with a coating of good old English mustard does it for me. Fried with potato bread and an egg. It's also delicious in an omelette. i put mine on homemade pizza, its yummy! Spam Fritters still love them. I like Spam pan fried with fried eggs. With pineapple in a sarnie! I have to say that i've only ever eaten fried in a sandwich and pretty much always in a cold and rainy caravan but that pizza looks AMAZING! would never have thought Spam could look so tasty. I look forward to rediscovering spam! It's best eaten sliced and grilled. It has to be in a sandwich! In bubble and squeak with a fried egg...heaven ! Fried, not fritters but fried on its own and served with chips and vegetables - delicious. Grilled and served for Sunday breakfast with Eggs, Tomatoes, Mushrooms and Toast. I love it on toast and popped under the grill! Spam Sandwiches, mmm. takes me back. Spam, fried egg and home made chips. We've always just had spam, chips and beans...I'm going to try different things now though! Saw a recipe for spam canapés which I quite fancy trying. SPAM FRITTER - CLASSIC ! I enjoy my SPAM with Mashed Potato and beans. In Shephard's Pie - honestly it's really good! I like it fried, then eat it on toast with a fried egg on top. Grilled Spam and cheese sandwiches.